Of Italian parentage, Michael Gaspard Rizzello was born in London in 1926 and educated at the Oratory Central Boys' School, Chelsea. After military service in India and the Far East (1944-8), he studied at the Royal College of Art, where he won both the Drawing Prize and the Major Travelling Scholarship in Sculpture, which enabled him to study in France and Italy. In 1951 he was awarded the Prix de Rome for sculpture. Rizzello then set up his studio in Hampstead, north London. Finding commissions hard to come by in austerity Britain, he began his career by making wax heads for Madame Tussauds. His first major commission was a full-size likeness of Lloyd George in bronze, which was unveiled in 1960 and stands in Cardiff's Cathay's park. From then on his order book was never empty. His portrait bust of Sir Thomas Beecham stands in London's Royal Opera House. He then won commissions from the Royal Mint to make portraits for coins and medals, which was to remain an important part of his work for the rest of his life. Mr Rizzello designed the Sierra Leone circulation set released in 1964. Above you can see the half cent from the series. See also: Sierra Leone: alternative designs. Mr Rizzello designed some of Ghana's circulation coins of 1967, depicting cocoa beans. For some related but unreleased designs, see also: More Mystery Coin Designs. Also in 1967, Mr Rizzello designed circulation coins for the Congo Democratic Republic. 1] The Congolese Republic: Unadopted coin designs from the Royal Mint. 2] Zaire, and the many faces of Mobutu. Also in the mid-1960s, Mr Rizzello created the reverse designs for the Gambia’s first independent coinage, dated 1966. A collector coin depicting a hippo, and with a face value of eight shillings, was released in 1970, but this was not designed by Mr Rizzello. Though the Gambia was and is a republic, the obverse of the coins portrayed the new portrait of Queen Elizabeth II by Arnold Machin, in her capacity of Head of the Commonwealth. Mr Rizzello's mischievous crocodile is among my favourite modern designs. See also: The Final Mystery Design Quiz! for some unreleased designs by Mr Rizzello. In 1971, the Gambia switched to a decimal currency, in which one dalasi was equal to 100 bututs. Modified versions of the predecimal designs were arranged by Mr Rizzello, which were transferred to the new coins. He also designed the obverse portrait of President Sir Dawda Kairaba Jawara. In 1977, Mr Rizzello designed three collector coins on a conservation theme for the Gambia: 20 dalasis, featuring a spur-winged goose; 40 dalasis, depicting an aardvark; and a gold 500 dalasis coin portraying a sitatunga antelope. In 1970, Bermuda released a circulation coin set whose reverse designs were created by Mr Rizzello. Below you can see the 1 cent, 5 cents and 10 cents coins. 1970 also saw the release of a series of Food and Agricultural Organisation-themed coins for various Caribbean states: Antigua; Barbados; Dominica; Grenada; Montserrat; St Lucia; St Vincent; and a joint issue for St Christopher-Nevis and Anguilla. These were all designed by Mr Rizzello, and some of them can be seen below. See also: Trinidad & Tobago: FAO One Dollar Proto-Sketches . 1c. Pineapple with sheaf of leaves. 1L. One lilangeni. Woman and child. Common obverse: King Sobhuza II. Some of the coins can be seen below. Also in 1974, the Franklin Mint released a set of collector coins for Belize. Though the lower denominations look as though they belong to a circulation set, I understand that none of them ever circulated. Common obverse: Coat of arms. The cent and the dollar from this set can be seen below. In 1976 the newly independent Seychelles released a new series of coins depicting wildlife. The reverses were created by artist Suzanne Danielli, but the obverse portrait of President James Mancham was the work of Mr Rizzello. In June 1977, President Mancham was deposed in a coup by Prime Minister France-Albert René. Also in 1976, Liberia released a 50 cent coin and a dollar coin, both of which carried Mr Rizzello’s portrait of President W R Tolbert Junior. 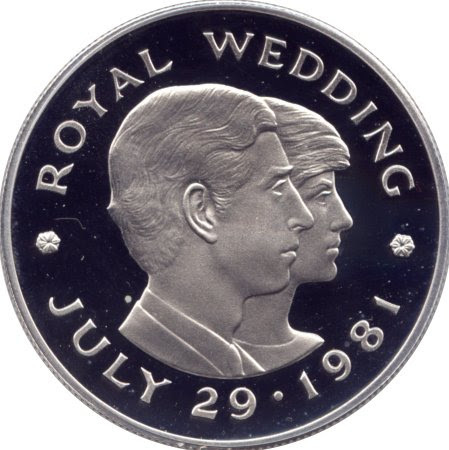 In 1981, Jersey issued a two pound coin to commemorate the wedding of Prince Charles to Lady Diana Spencer. The portrait of the doomed couple was created by Mr Rizzello.